Like everything else, the longer we use something, the faster it wears down—even our bodies! And our knees and other joints are particularly sensitive to this wear and tear. As the knee “wears out” you’ll find it harder to run, walk, bend or even put weight on your knees. As the pain gets worse, your doctor may start talking to you about knee replacement surgery. It’s okay to be scared. Don’t feel bad if your first reaction to “maybe we should start exploring knee replacement surgery,” is fear! We know that all surgeries—regardless of type—carry some inherent risks, like adverse reactions to anesthesia, post-op infections, blood clots, your body rejecting the implant, etc. And everybody understands that the recovery time for a total knee replacement is long and frustrating. To add insult to injury, the likelihood of your experiencing one of these risks increases as you age. It would be strange if the idea of surgery didn’t scare you at least a little bit! It scares me. Click the button below for our free guide to overcoming knee pain naturally. Here’s some good news . . . Thanks to advancements in the use of stem cell treatment for knees, surgery is not the only option. Yes, really! There have been many innovations in the use of stem cells for knee injuries and arthritis. While stem cells may come from various sources, our focus is on using your own cells. Yes, as adults we are constantly regenerating our tissues and organs. In fact, all healing relies on our body’s own natural ability to heal itself. Let’s see how stem cell knee injections might be able to help your knees and keep you out of the surgery suite. Stem cells are, essentially, “building blocks” of our body. Our own stem cells found in our bone marrow, blood, and adipose tissues come from the same family of cells that form joints, cartilage, menisci, ligaments, muscles, and bone. These cells can be utilized to help repair your joints. How do adult (your own) stem cells work? When we, as humans, are conceived and growing in utero, we start out primarily as stem cells, then as we grow and develop, those blank cells become liver cells, skin cells, nerve cells, etc. As we continue to grow, our bodies continue to produce these stem cells to treat and maintain our bodily systems. This means that these cells can be used to treat like-minded tissues all over the body, including stem cell knee repair. Currently, using your own cells, we can help repair joint damage from arthritis and sports injuries. As we learn more about our own stem cells, we expect to treat more and more conditions. Just like the discovery of penicillin almost 100 years ago changed the face of medicine, discovering the potential of our own cells to heal our own bodies will dramatically alter the landscape of medicine in the years to come. We’re excited about stem cell treatment for knees because stem cell knee injections can exponentially reduce a person’s need for surgery. Instead of having to replace a knee with an artificial implant, stem cell therapy in knee-joints can be used to regrow new and healthy tissues that have been damaged or are degenerating. We’re already aware of the several risks associated with knee replacement surgery. They’re big and scary. When you choose stem cell therapy as an alternative for knee replacement, however, most of those risks evaporate. The biggest risk you’ll face is the risk of infection, but that’s extremely rare because the procedure is minimally invasive. The benefits of stem cell treatment for knees, on the other hand, are huge. Check it out. Compared to surgery, the procedure is quick. We have our equipment and labs in-house, and the outpatient procedure can be done in a single day (a few hours, to be more precise). Your initial consultation, exam, and treatment planning are all done for at a low cost to help reduce your treatment expenses. Stem cell therapy for knees is natural. We do not produce synthetic stem cells. We don’t even use donor cells from embryos or other adults. Instead, we use your own stem cells. We literally take your stem cells from one part of your body and inject them into your knees or other problem areas. And the treatment is complete in one sitting. It’s as natural as you can get! When it comes to surgery, the recovery time can last for months, many of which you spend immobile or with your mobility severely limited. But with stem cell knee injections, this is not the case. You walk in and walk out of the procedure on your own, and your daily routine should stay the same. In a few weeks, you begin to increase your activity levels and do more! And now for a stem cell knee repair success story. Jarvis Green is an NFL player whose knee injury was so bad he ended up having to rent a home with an elevator. He had two surgeries, neither of which helped him. He couldn’t do much of anything. After undergoing stem cell therapy for knees, he saw profound improvement in his knee function. He could run, swim, bike and even go through training with his teammates. 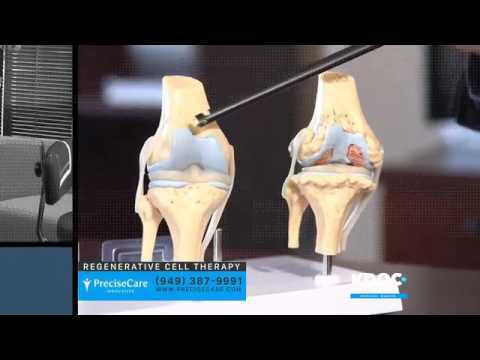 How Do I Know If Stem Cell Therapy for Knee Pain Is Right for Me? The best way to find out if you’d be a good candidate for stem cell therapy is to talk to a doctor. Book an initial evaluation to find out if PreciseCare Cell Therapy is right for you. There are also great resources that can help you learn more about how stem cell treatments can help reduce pain, help knees repair naturally, and how to take control of your life back from that pesky cartilage. Watch the video to learn how PreciseCare helped alleviate Gustavo’s hip pain.